PRINCETON, NJ -- As Newtown, Conn., students begin classes for the new school year, more than eight months after last December's massacre of 26 teachers and children there, U.S. parents of school-aged children appear to be no more at ease than they were immediately after the incident. Thirty-three percent of K-12 parents say they fear for their oldest child's safety at school, unchanged from last December, and higher than the 25% at the start of the 2012-2013 school year. The data are based on Gallup's annual Work and Education poll, conducted Aug. 7-11. Parents of school-aged children had been expressing less worry about their children's safety in the five years prior to the shootings at Sandy Hook Elementary School in Newtown, with the percentage fearful ranging from a low of 15% in 2008 to 26% in 2009. However, at times in the past, parents have expressed more worry than they do now. The high of 55% came immediately after the Columbine High School shootings in April 1999. The percentage of parents concerned generally remained elevated until about 2001 as similar school shootings took place at other schools around the country in the years that followed. Perhaps one reason parents' level of concern is lower in the aftermath of Newtown than in the aftermath of Columbine is that Americans may be a bit more accustomed to hearing about similar tragedies today than at the turn of the century. Thus, Americans may be more used to coping with them when they occur. 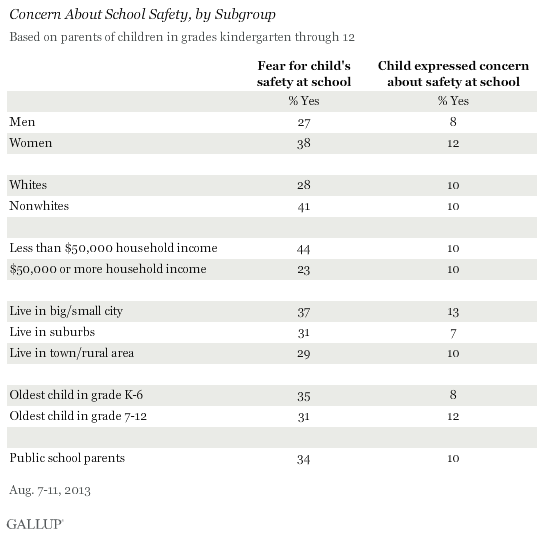 Among subgroups, the largest differences in concern about children's safety at school are by household income. Those whose income is less than $50,000 -- roughly the national median -- are nearly twice as likely as those whose income is $50,000 or above to worry about their children's safety at school. That may reflect on the areas in which people live, as those with higher incomes could live in areas in which school violence, including bullying and gang activity in addition to shootings, is less common. Schools in upper-income areas may also have better resources to deal with school violence, including hiring security personnel, school psychologists, and guidance counselors. Possibly related to the income differences, nonwhites are more likely than whites to be concerned about school safety, and those living in cities are more concerned than those in suburban and rural areas. Also, mothers are more likely than fathers to say they are concerned about their child's safety. There are minor differences between those with older vs. younger children by grade. Public school parents' concern is virtually the same as the 33% national average. Notably, despite the wide gap in parental concern by household income, lower- and upper-income parents are equally likely to say their child has expressed concern to them about his or her own safety. There are at best modest differences in other subgroups in terms of children telling their parents they feel unsafe at school. The beginning of the school year is a time of hope and optimism for parents and children as students open a new chapter in their education. But for many parents, the school year also brings a sense of trepidation about their children's safety as a result of the series of school shootings over the past 15 years. The Newtown shooting was arguably one of the more tragic such incidents, given the number of deaths and the age of the victims, and its effects on parents' fears seem to have persisted to this day, more than eight months after the event. The tragedy has prompted many schools to increase security measures in an attempt to prevent a similar event from occurring at their schools. Perhaps one of the comforting things is that children themselves are no more worried about their own safety than they were before Newtown. This may be because younger children are largely unaware of the incident, and older children may have been reassured by school officials and parents about the steps schools are taking to ensure students' safety. Results for this Gallup poll are based on telephone interviews conducted Aug. 7-11, 2013, with a random sample of 508 parents of children in grades kindergarten through 12, living in all 50 U.S. states and the District of Columbia. For results based on the total sample of parents, one can say with 95% confidence that the margin of sampling error is ±5 percentage points. Minneapolis-St. Paul area residents are the most likely to say they feel safe walking alone at night where they live, among those who reside in the 50 largest U.S. metro areas. Memphis area residents are the least likely to feel safe.